We all know that one of the great pleasures of the bounty of summer is that it tastes so good you don’t need, or want, to do much beyond getting it to the table. But as with writing, and perhaps as with anything, restraint in cooking has its challenges. 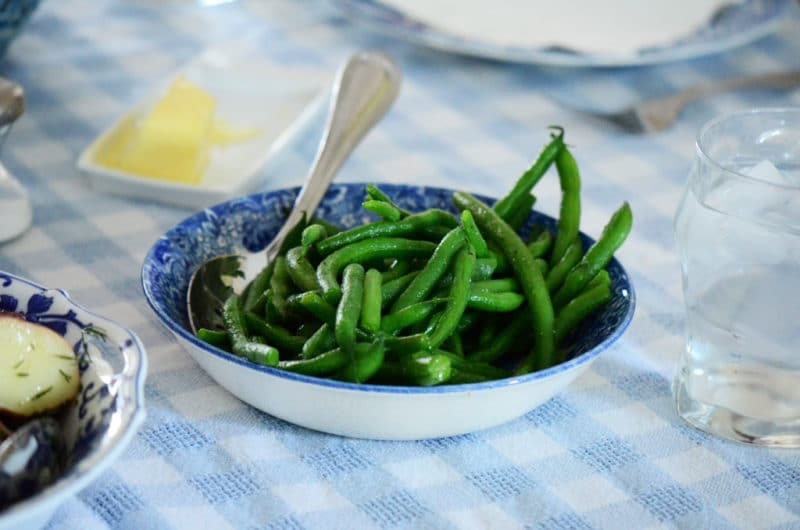 Restraint requires attention to detail so that cooking times and seasonings make green beans and corn taste even more like green beans and corn. For the corn for this meal, I do nothing more than break it in half, cook it for 3-4 minutes in plenty of boiling water (not salted; we’re after sweet here), drain, and serve. There is soft butter on the table but I rarely butter my summer corn because it just doesn’t need it to taste great. For the good bread, there is no bread baking on Main Street in summer. No air conditioning here, and the oven on would make the house crazy. But that just gives me the great joy of fetching my loaves (the epi or the seeded baguette) from Crooked Tree Breadworks, our local treasure. Trim the stem end of the beans by gathering them together facing the same direction and snipping all off with a scissors. I like to keep the curly point on; they’re pretty and especially tender in summer. Bring a large pot of water to boil. Salt it well (a tablespoon or two). Add the beans. Boil for 3 minutes. Drain. Add olive oil, salt, pepper, and garlic powder to taste. See how bright green they still are, with a little crunch? Perfect. 2 Responses to "Whitefish dinner: Green beans, corn and good bread"
Just made this last night with New Jersey corn and fresh green beans and savored every last bite knowing that come Winter, I will be remembering the bounty of Summer. With the new varieties of sweet corn there is no reason to cook at all. Simply put in the microwave until suitably hot. This also preserves the nutrients which would otherwise go into the boiling water and feed the drain. This is why it is good to use a farmer’s market where one can ask about varieties. With the old varieties the outer part of the kernel was tough, with the newer varieties, due to genetic engineering, it will never get tough. Not even when it is well past eating stage. Ask if the corn is SH2 (shrunken 2 gene) or a newer variety. The SH2 has been out for about 20 years and several improvements with even stranger names are being grown, but as long as it’s newer it’s better. If you are told SE (sugar enhanced) these varieties have an extra sweetness gene and great taste but still need to be cooked tender. If you are told that it is SU (standard unit) that is an old variety like Grandpa grew. Avoid it. It was great when Grandpa grew it but things have definitely improved. Because “heirloom” varieties are the fad, some is still offered. But I need to put in a warning for the home gardener. The variety you plant should depend on whether your close neighbors are also growing corn. If they aren’t growing the same “family” (SH2,SE, SU or field corn) that you are growing it could lead to a bad result. Corn is wind pollinated and if the pollen of a different family crosses the genetic results are unpredictable. If neighbors have close gardens, I would recommend you grow something else (corn takes a lot of space anyway) and support your local farmer’s market where the grower plants an entire field and understands the crossover problems.